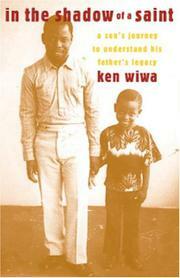 A biography of the late Nigerian activist Ken Saro-Wiwa, a man as personally complex as he was politically elemental. “Where does his life end and where do I begin,” wonders Ken Wiwa, whose father was executed by the Nigerian military regime in 1995 on flimsy charges that he was involved in the deaths of four Ogoni chiefs. What is clear is that the military was happy to be rid of a vibrant critic, but killing Saro-Wiwa turned him into a martyr and a myth—an important symbol for the Nigerian opposition, although a difficult one for his son to come to terms with. In this inquiring biography, Wiwa reexamines his and his father’s lives, poring over the intersections and near-misses, resentful of the complicated legacy, the atoning for his father’s sins, justly proud of his principles. Wiwa handles plenty of confusion and guilt with aplomb as he unravels an irascible, emotionally demanding, and domineering father, yet also a man who called the military, corrupt businessmen, and greedy multinationals (the “lootocracy”) to task for their wanton despoliation of Nigeria—a country massively rich in resources that nonetheless owes billions in external debt, has a prehistoric infrastructure, underfunded schools, high infant mortality, low life expectancy, and hospitals “best described as mortuaries.” Saro-Wiwa made a lot of enemies through his writings and organizing, and they killed him. Wiwa’s childhood recollections are ambivalent: he describes his nervousness and self-consciousness around his father, his sense of always trailing in his footsteps (which meant he never, ever caught up). Until this biography, that is—its voice very much his own, as is its political verve. Insightful chapters on the children of Nelson Mandela and Stephen Biko add poignancy and depth to Wiwa’s personal exploration.